With much ado, the official Mass Effect 3 launch trailer has finally hit the web. Arguably one of the most highly anticipated games of 2012, the video offers a glimpse into what players can expect in this third and supposedly final installment. BioWare's two minute clip deftly conjures a gut-wrenching sense of impending apocalyptic urgency as all hell breaks loose between Reapers and Humans. Commander Shepard is once again a focal point of the story while some familiar faces are said to make their return in Mass Effect 3. The game promises co-op, action and story modes, a high-degree of customizability, a tweaked reputation system, completely redesigned enemies -- some foes actually measure more than a mile tall -- and a rich story line where the underlying premise seems to be "survival at any cost". DRM has been a point of contention for the upcoming title. Casey Hudson, executive producer of Mass Effect 3, responded to concerned fans and promised the game does not employ an "intrusive DRM scheme". Despite this, Origin -- Electronic Arts' answer to Steam -- must be installed in order for Mass Effect 3 to run. "I think that the people who try Mass Effect 3 on Origin will realise that it's not an intrusive DRM scheme," he added. "It's just a way for you to sign up for the online services that you're going to get on an ongoing basis through Mass Effect 3. "Just like you get with any other kind of online digital distribution, or multiplayer or whatever. 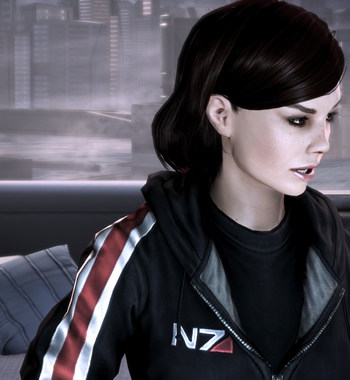 It's not something that requires you to always be online - you can play Mass Effect 3 offline." Mass Effect 3 will debut in the U.S. on March 6 (next Tuesday) for Xbox 360, PS3 and PC. A subsequent launch in Australia is slated for March 8 and the European release will fall on March 9. BioWare will also release a collector's edition with exclusive items, various DLC and a stand-alone digital soundtrack. Game Group, a UK-based game retailer, will not carry Mass Effect 3 because of a dispute with EA. You can bet it will be widely available from a number of other outlets though, including EA Origin, Best Buy, Gamestop, Amazon and EB Games. Some stores are also offering incentives. Buy.com, for example, offers free shipping and $20 in credit points for those who pre-order the game today. Eager players can get their feet wet with the demo before it hits the shelves next week. There's a lot of people back on Earth dying while we gather our strength. They're wondering if we're ever coming back. Friends, family, parents and children. This isn't their fight, but they're buying us time with their lives. We need to stand together. The Reapers won't stop. They'll destroy every organic being in the galaxy if we don't find a way to stop them. Go out there and give them hell. You were born to do this. Build the lines. Gather everything and everybody you can. Don't interfere with my plans, Shepard. I won't warn you again. Go to hell. Each of you need to be willing to die -- anything less -- and you're already dead. This is it... isn't it?